This short (48 pages) book was written for a young audience, perhaps a high school student. 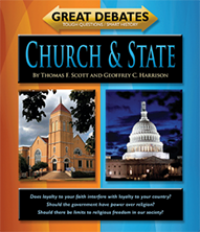 It explores the relationship of "church and state" in the American governmental system, in a "debate" style format. The book is broken down into different chapters, each asking a question regarding the role of religion (or non-role) in American government. One example is: should there be limits to religious freedom in our society? Another is: should the government have power over religion? The authors do a good job of setting up the debate, starting with the beginnings of our country, and into what the founding members said or didn't say in developing the constitution. Each question is dealt with fairly and with balance, presenting both sides of the question. The only thing that I did not like in the book was the use of confusing graphics throughout. Perhaps, because this was an ebook, the graphics would be more useful in an actual printed book. This book could be an important tool in our children's educational growth, especially today, with the current furor around immigration and religion. I would hope that parents would allow it to be used in the classroom, because it does provide an informed and thoughtful approach. Sadly, with the country so divided currently, I'm afraid that it would be shouted down by parents with their own agendas to push.